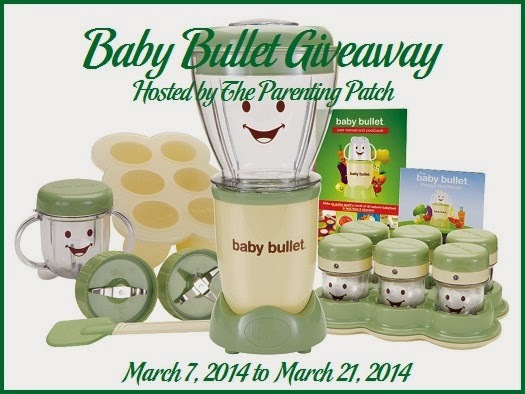 Welcome to the Baby Bullet Giveaway hosted by The Parenting Patch and sponsored by Baby Bullet. For more information about the Baby Bullet Complete Baby Care System, check out this Baby Bullet Review. The Baby Bullet Giveaway is restricted to legal residents of the United States of America and Canada. The Baby Bullet Giveaway ends at midnight CST on March 21, 2014. One winner will be chosen at random via Rafflecopter. The winner will be sent an email and will have forty-eight hours to respond. If no response is received within forty-eight hours, another winner will be chosen. The Parenting Patch and Disney With Babies Toddlers & Preschoolers not responsible for prize fulfillment.